Main entrance of building to junior side. The high wall on the right surrounds the yard at the back of the police station. on the corner of Garfield Road. 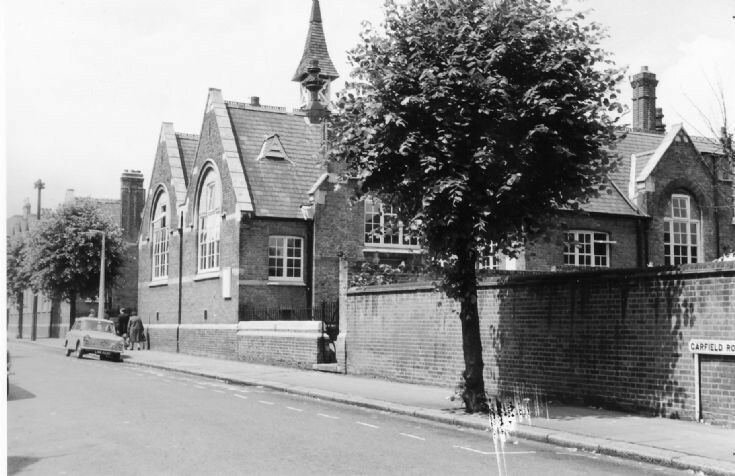 I am tracing my family tree, and my great grandfather Geoffrey Thompson was born in New Southgate 1882, just wondered if he might have gone to this school. Do you have records? I also remember that school so well, going into the school in 1960,I had a cane for stepping over the white line,my Grandmother and my mother and my Brother & my Sister went to this school,I was so upset when they pulled it down. You lived opposite me and John Lewington in Upper Park Rd up until 1964, and I traced you to living on the coast - Hastings? You are very welcome to join several other Upper Park members of our annual Garfield School Reunion - Terry McCullough, one of your closest neighbours, John Lewington, Mike Burton and Ken Dunham. You lived next door to Alan Dean. Good luck. Inremember Alan Dean who lived in Upper Park Road. We went to Arnos Park to play in the summer holidays and he fell in the Brook that still flows through the park It was a hot summers day and we had to walk around the park untill he dried out otherwise we would have all copped it from his mum. For Tony Brooks - Alan Dean lived opposite me and Mike Burton in Upper Park Rd from 1948-1964, and there are other close neigbours, Ken Dunham and Terry McCullough, in our mid 1950s Garfield School Reunion group still holding annual reunions at the Conservative Club, so get in touch via this website if you want to contact Alan's friends. Alan went on to be a docker, and his father was a park keeper, I think. Ken had a link to talk to Alan but got no reply. Good luck. I went to this school from 1958 to 1961. Our teacher was a bit of a monster and a slap with the ruler was quite frequent if you didn't listen. Both my sisters and I attended Garfield Road School. As did our Dad and his siblings. I started there in 1955, attending the nursery. Mrs Philips was the teacher in the nursery and the assistants was named Jean. We all had our own coat pegs, mine was a picture of a kite! Lived in the High Street New Southgate in the 60's and went to Garfield school. Good memories. Mr Bone was class master then became Headmaster after Mrs Philips retired, then Mr Morgan took over the class, with his white plimsoll ready to dish out the discipline. I went to this school in 1951, but had a road accident which kept me off for a year. When I went back in 1953 all my friends had made new friends and I can't remember any of their names now. I lived in Arnos Grove Court, The Lymes Avenue. Hello Sandra - we have an annual reunion of Garfield scholars from 1935 to about 1974 when it moved to Springfield Road, Next one is 12 May 2018 at the Conservative Social Club on the 1st floor, from Noon to late afternoon, free entry and food, displays, photos, books of memories, street tour, short film, club bar open, about 60 people there from the 40s to 70s. Contact me on 01782 551849 for more information, or email - peter.len.turner@gmail.com. I would love to be there, however I live in Hythe on the South Coast, but have plan as my sons all live in Beckenham and it would be a simple South Eastern Train and the tube to Arnos Grove. I was here between 1958 and 1961, still in contact with Linda Lawrence who lived up the road from me in Springfield Road. Another good friend was Jennifer Lane, she also lived in the same road. If anyone is still in contact with Jennifer or her sister Angela please let me know. Someone mentioned the Piano Teacher in the fifties. I think it was Miss Vincent. She ran the top class in the school. Very strict but she encouraged me to join the choir and was actually quite funny. Does anyone know of Colin Smith would have been there in 1947 to 1951 ish . He was a brilliant kid. Good at everything Football, Singing, Art, Maths,writing. But he had a car accident very seriously injured but recovered, I took his job as leading choir boy at St Pauls church. The Mmories books are about £5 each plus postage unless purchased at a reunion. One of them is just about the school with emails from pupils, photos and maps of the school layout, teachers and events.